Though Conceptually I am not 100% certain on design elements I feel I have pushed enough concepts through that I have a strong understanding of the feel that the character should have. I took to sculpting software to start blocking in main forms over the previous basemesh. I decided to do this as I knew I'd be able to push around some of these base forms even after sculpting them to get them into a position that works. This also lets me better visualise the character in 3D. 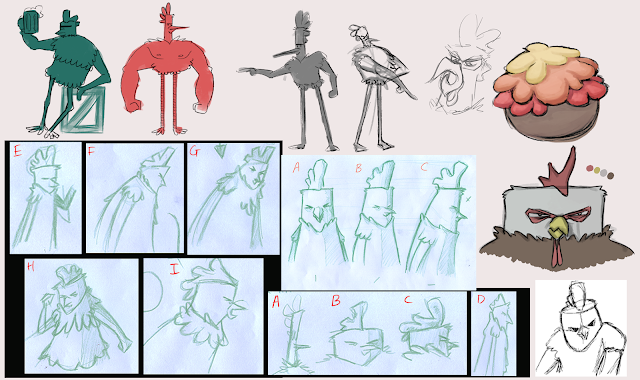 I explored some new design choices through sculpting and did some changes that I felt weren't coming through in the concept art but were still coming strong with the character design. I also felt moving to 3D gives me a larger range within my personal limitations of both drawing and sculpting. Some choice changes along the way are notable in the face, hands and legs. I decided to have the hands as 3 fingers and a thumb, this is due to chickens only having 4 toes on their feet and I wanted to mirror this in his hands. I also found experimenting with the legs much easier in 3D and found some proportions that I feel come across as both chicken-like and strong enough to hold him up without compromising the chicken legs. The initial test of feathers around the neck will be re-done and further experimented. This is due to the layering of feathers requiring to be started lower but also because I wish to make multiple Alpha's to add more variation to the feathers. I exported the current state of the mesh into Maya to do a quick turntable on my look-dev setup to get a feel for how he looks from all angles in a lit environment. Honestly very happy with how he has turned out so far though looking forward to iterating on his design. 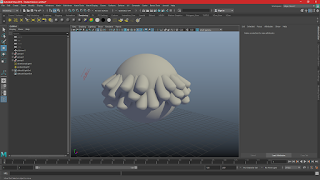 Moving into the realms of pre-visualisation I have begun to set up my maya project folder to lead into production, setting up various reference and look dev files to easily visualise how visual development of the piece is going. I began to block in the smaller chicken character and referred back to BiRB to see how both characters stand next to one another. Pre-Vis has really helped better visualise shots and analyse their strength within the piece. This still requires some extra work and iteration but really starts to pull together an idea for how the shots are working and getting an idea of how the environment is working in the shots. After creating a small previs barn its become much easier to see what shots need more props and an ability to visualise how those props will best be placed in the scene. I also put some consideration into aspects that may not be seen in the shots to get a feel for what is going on in the environment as a whole. I put in some simple green lighting to help get across the mood of the piece and to consider how I may light the environment. Currently only Hardware 2.0 for quick concepting but will move into arnold toward final. I really need to transfer off of character development and really answer some narrative and environment questions. 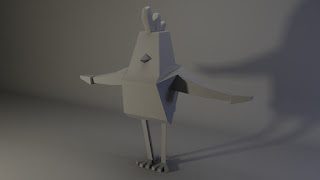 But I wanted to start to staple down what my character will be as soon as possible due to requiring modelling, rigging and finally will be integral to the animation, thus I have considered this as one of the most important aspects to complete. 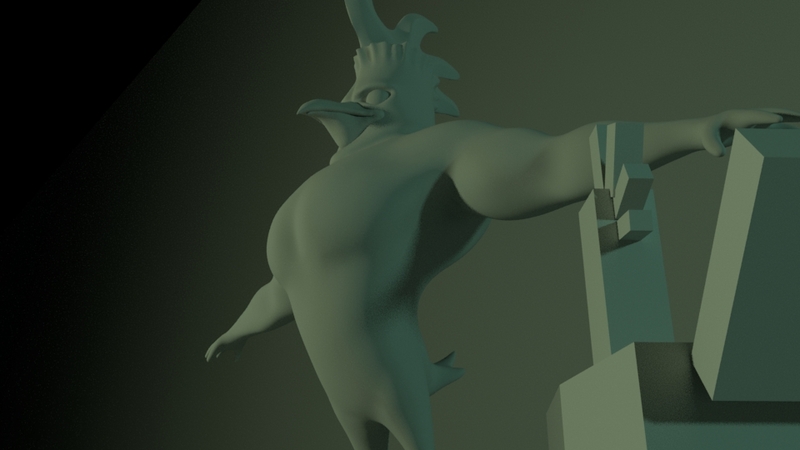 Starting with a basic structural T-pose I began to consider some elements of detail that would fall across the form, such as his feathers. 'D' and 'E' are appealing but the idea of doing fully feathered wings may be out of scope for the project. Taking to 'K' I found I was starting to lose some of the sturdy form by introducing feathers that fell across the body too smoothly so I started trying to ruffle him up in 'F'. 'L' was an approach inspired by 'Grandmaster Bird Guy Thing' with the feathers layered from the chest outward. This felt like it was starting to stray too far off my design and I really needed to consider how I might approach this in a way that is technically plausible and effective for the character design. I took to 'I' and started to consider the rig inside the character itself. 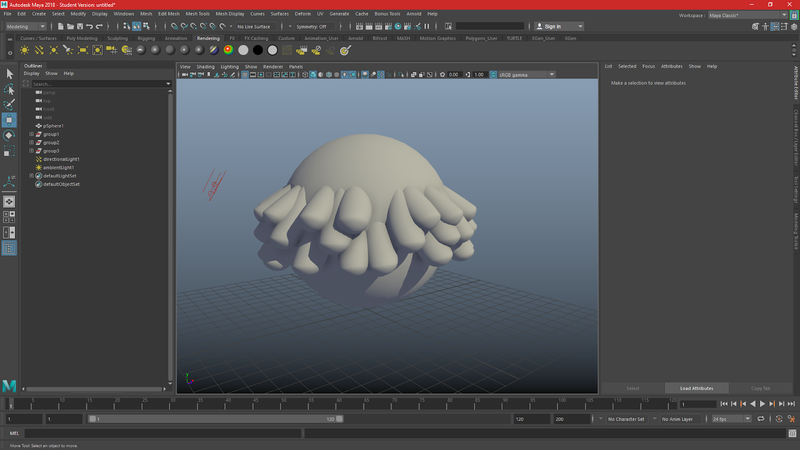 Though I'd like to experiment with squash and stretch elements the initial parts will be getting the rig functional. I intend to explore squash and stretch in the head as without a neck I feel this will help improve his range of motion. The arms and legs squash and stretch would be a bonus but not a necessity. I started blocking some forms out in 3D to see how his proportions look. I also did some small tests with a ribbon rig to get a feel for how I might take the approach. I realise I needed more joints for it to work more effectively. Liking how this is looking even on a very primitive level. Still needs some adjustments to its overall shape but general I think the direction is working well. After some tweaks and tests with the mesh I took a screenshot to take into Photoshop to explore the character details more. This is helpful to visualizing the volumes of the character and making decisions that better represent how the final form may look and the location of changes on the geometry. 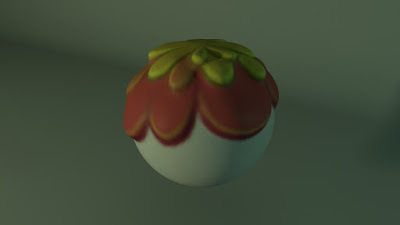 This definitely helps reduce gestural details and really inspires thought into where each detail connects in 3D space. exploring some accessories and detail designs, 'E' has some appealing feather design that both shows structure and personal upkeep while still letting on a little bit of being rough around the edges. Generally I feel the facial proportions need some minor tweaks as some aspects don't look as strong as some of the earlier concepts. 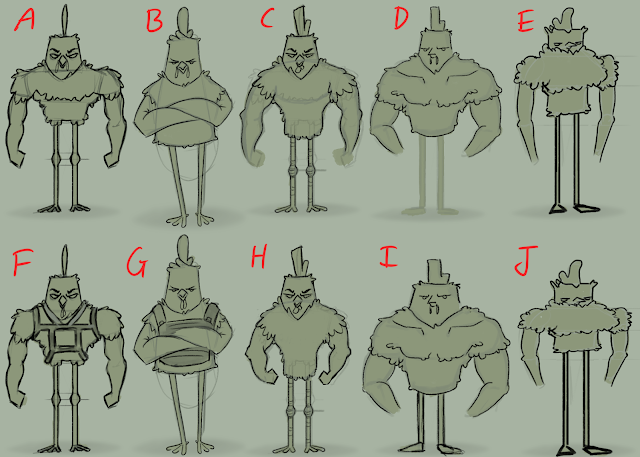 Body elements I believe are solid though some extra pushing of the forms to accentuate the upper body may look good. Going to try a Zsphere approach to blocking forms and depending on the success, doing another block out using maya. 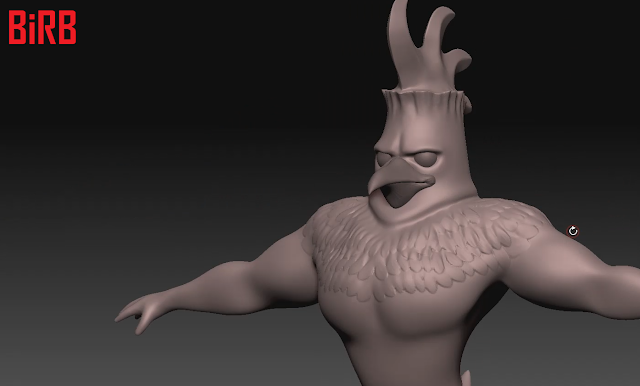 As mentioned, the chicken head won't have much of a functioning neck, thus I started to do some tests with a previous character rig to get a feel for how I might create a squashy head. I will likely use this method as a replacement for at neck rather than having both. I aim to have a more flexible version of this squashy system in place. I did a small animation to get a feel for how the squash and stretch would affect my characters performance. I've got a various number of sketches and design pieces that are along the lines of what I want the character to become. So taking these and creating a mood board of my own sketches really helped me get a feel for what is working, what is not and overall mixing some different design aspects together. 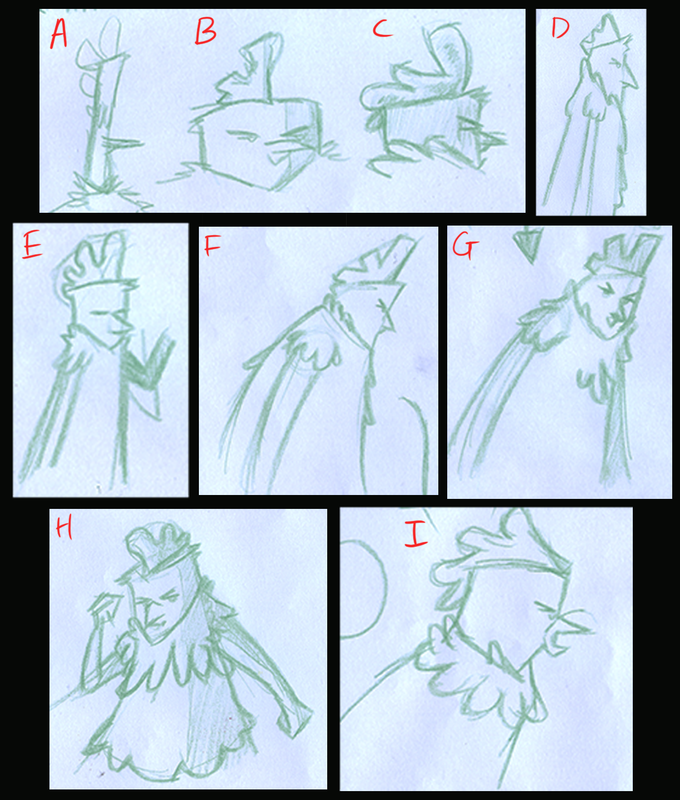 Having decided I want the animation mood to be green I've began using various green colours as a base to sketch. This is helping with seeing how things may look in the overall scheme but also help sell an overarching theme between all my concept pieces. 'A' has some nice broad shoulders, but his legs seem out of place. he almost looks like an amputated body on stilts. 'D' and 'H' fit a build that fits a military design but comes across as very strict while 'I' seems almost comical because of his stubbyness. I took to 'B' because I felt this gave a balance between the stocky build that is capable of being strict and loud but with an influence of informal approach. More along the lines of Ex-Veteran over Veteran, which would make more sense in his situation of dealing with a bunch of knuckleheaded chickens. Taking this sketch and exploring more I found his front view though strong, really left open the side view to have a number of proportions that still fit the same front perspective. This really highlighted to me how important multiple views of characters can be. 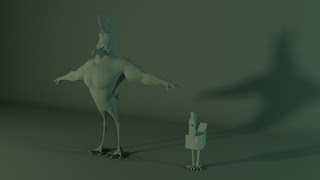 A few elements I am currently doing thought over are the arms and still questioning on the legs. The arms are a matter of how I want to layer the feathers. I do like separating the arms as a separate shade of feathers breaking his body, arms and head into different parts that are easier to read. His legs on the other hand are still in question due to chicken legs bending the opposite direction. Although functionally would be correct to bend backwards, it makes some posing of the character both difficult to read and less relatable. 'F' Although his upper body reads as relaxed, his legs struggle to communicate the same, they look uncomfortable even though correct. My thoughts on the dilema are to keep the leg mechanics to that of a chicken and drive the main bulk of posing through his upper body. This Should work well with his feet in IK, though I imagine posing that would be more FK would perhaps look odd. i.e. Sunbathing. Some colouring information to get a feel for how he could look both with the green colour scheme I am looking toward. Added some lighting information with different styles. a cell shaded approach and a gradient approach with a strong rimlight. Updated Animatic to help read some details and added a shot depicting the storm. Though the animatic will be going through an overhaul to incorporate some new elements. Similar to my character design I started to pull the various pieces I had done so far and incorporated them into a mood board to get a feel for the direction I am headed. 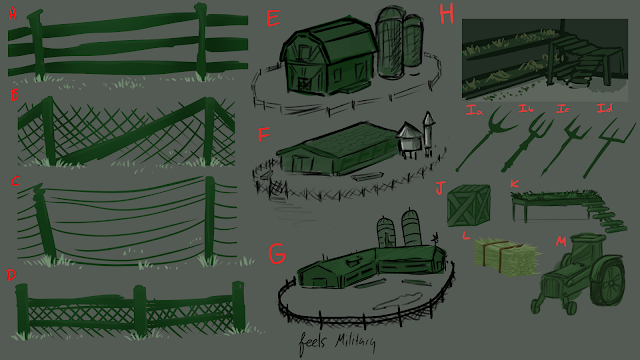 Starting to consider the type of farm, given my character is ex military and is only dealing with a small number of chickens I want to have the farm feel smaller, like a local village farm out in the country more so than an industrial farm. The industrial farm gives some good military vibes but would entail a larger population of chickens. As such would also look much more fortified than that of a smaller farm. I considered different fence types, then different structure types and used the fences along-side the structure to get a feel for how it compliments the environment as a whole. I also know that a big part will be tackling the interior design of the location and considering its function. The farm will mainly be manual labor and thus the chicken coop doesn't have anything majorly automated. Finding an interior that doesn't come across as too CG with copy-pasted elements and enough variation is key. I want various props scattered about without being too heavily duplicated. I re-rendered one of my test sculpts of the feathers with a green lighting to get a feel for how the lighting could be used to emphasise the look I am going for. On top of this I went into Zbrush to also experiment with other methods to sculpt detail without taking quite as much time as this previous one. What I am considering is using a mix of both with bulky feathers for parts such as the neck and arm where the feathers change and the below technique to add some subtle surface detail the the feathers overall. This will need some further exploration but the exercise has expanded my skill set to consider new approaches. I also tried a geometry method in maya using layered meshes. This wouldn't be super clean for rigging and my intention would be to take it into a sculpting package to clean up afterward anyway. So I felt this approach wasn't all that effective. I've narrowed down the character to definitely being an anthropomorphic chicken, though his design has not been finalised this is really a matter of milage within the same scope. What currently needs more exploration is the mood of the piece, the overall aesthetic. I'm working looseley, exploring various different shapes and ideas for both environment, particular shots and even some stylized characters. I familiarised myself a little with chicken farms both on the end of free range and taking a look into slaughterhouses, though brutal, the ones I had looked at were very clinical. The process was interesting and I suppose, sad but lacking in regards to elements that I'd be interested in using for my project. Though could use some further looking into, perhaps less on large scale and more in the vein of manual labour on a smaller farm. 'C' for me really emphasises the danger of an oncoming storm with the strong red and yellow, but I do really like the musky green tones in 'E' and 'F', brings in a sense of smog, a world that does not treat well to those unprepared. 'H' and 'I' are good fun, but definitely giving off a rave vibe that doesn't really fit the context. Though I may not use the style of 'O' and 'P' I'm finding it quite interesting to consider how they could be depicted in 3D. 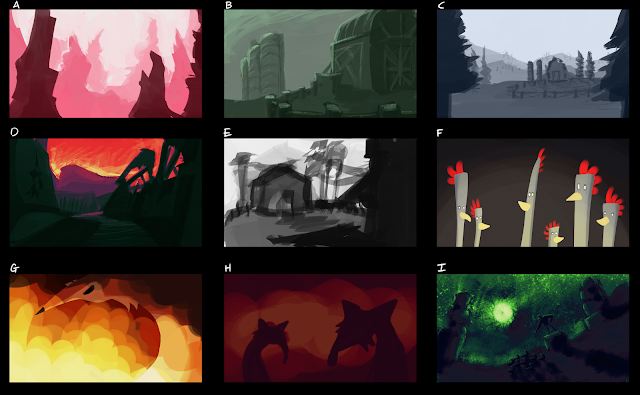 Further composition and environment tests. Again, finding the musky green tones in 'B' to be something I'm leaning towards. 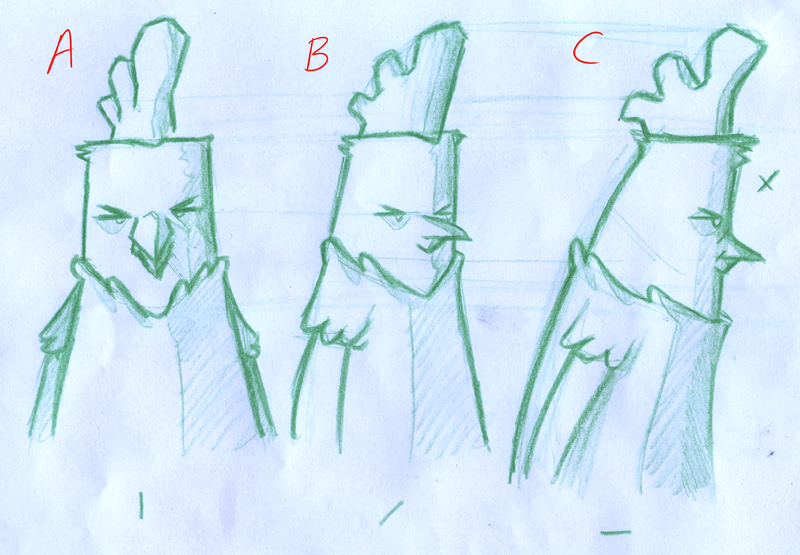 'D' takes the scale up, making the world almost apocalyptic, run down, falling apart and the chickens have to survive. 'F' Puts them into a dark isolated environment, perhaps inside the barn, almost as if being interrogated or plotting something. 'G' and 'H' were some explorations into the idea of foxes, but using them in the context of a storm, considering them as a shape language for the storm itself rather than a threat of actual foxes. Finally here, 'I' a composition that is dramatic and somewhat impending, the scenery is not quite final, but the colours and the comp itself is something that I'm really feeling for in regards to the storm, this does go more into the realms of fantasy and very much reminds me of Fel energy from World of Warcraft. The brush for 'I' was definitely good fun and gives great texture. 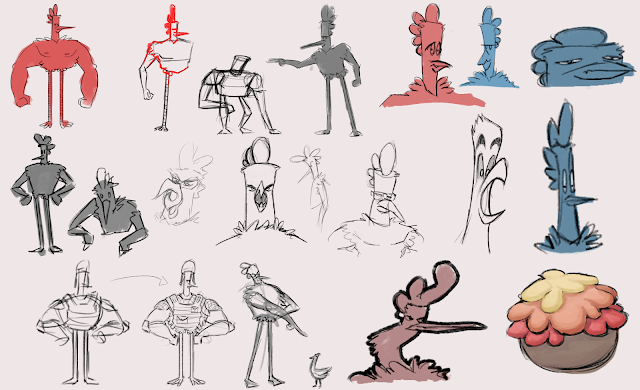 Being fairly happy with the development of ideas I started to block in my main poses that I want in the animation through my animatic. 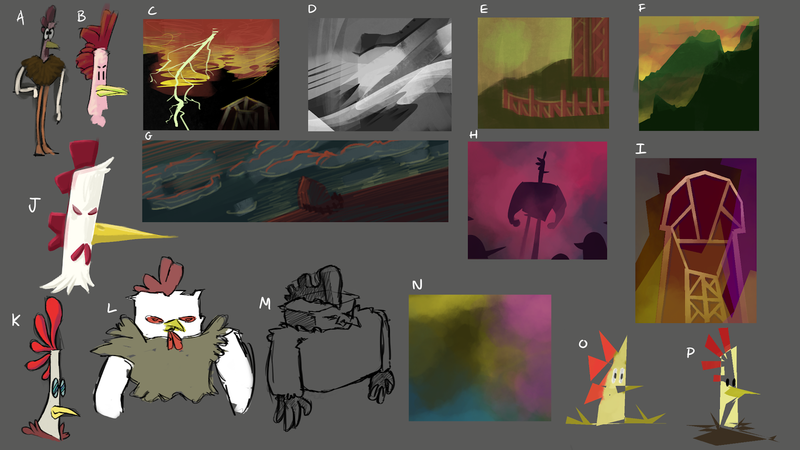 There were some parts that I couldn't quite think of transitions or idle gestures and thus blocked in aspects I know I definitely want and re-visiting inbetween parts later. Some ideas are shots that show the location and the storm going on around it while in other cases I plan to take my animatic as a base for another acting reference video to see what may come to mind. I was listening to some new music through spotify. Something I enjoy doing as I can sometimes discover pieces that I would not have expected to like and amongst those, pieces that strongly evoke a feeling or mood to the extend that I can almost visualise an animation to the music. I discovered Infinite - Notaker a piece that came across to me as gritty and deep, I was beginning to visualise a cast of gritty war-veteran like characters banded together walking over the horizon, which in turn inspired some ideas for walk cycle motions that I wanted to experiment with in my character. This is both a test for how well the character holds up in motion, his construction and potential for character. 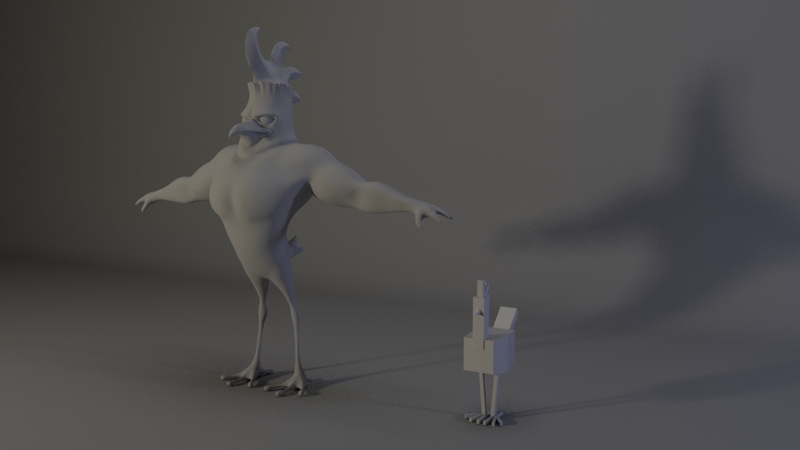 I was also able to overcome the hurdle of how his feet would look if the mechanics were that of chicken legs. Though they do look unusual when focusing on them, they seem natural on the character as a whole. Taking a step back from the concepts for a bit I decided I would look into solving some potential technical issues in regarding to creating the character and surface detail. My plan for the project is to use Zbrush but I am open to using other techniques if I see fit based on my later concepts and how the techniques look in 3D. Now that I've gotten some ideas for execution I've headed back to character concepts. Trying to capture some sense of gesture and posing through the concepts. I found that one of the problems I am running into is that I haven't fully established the final goal of what the character is to achieve, causing my designs to vary drastically with some vaguely working and others barely working at all. Liking the contrast of a small head, thin legs and almost entirely upper body. exploring through different poses, expressions and squash and stretch. 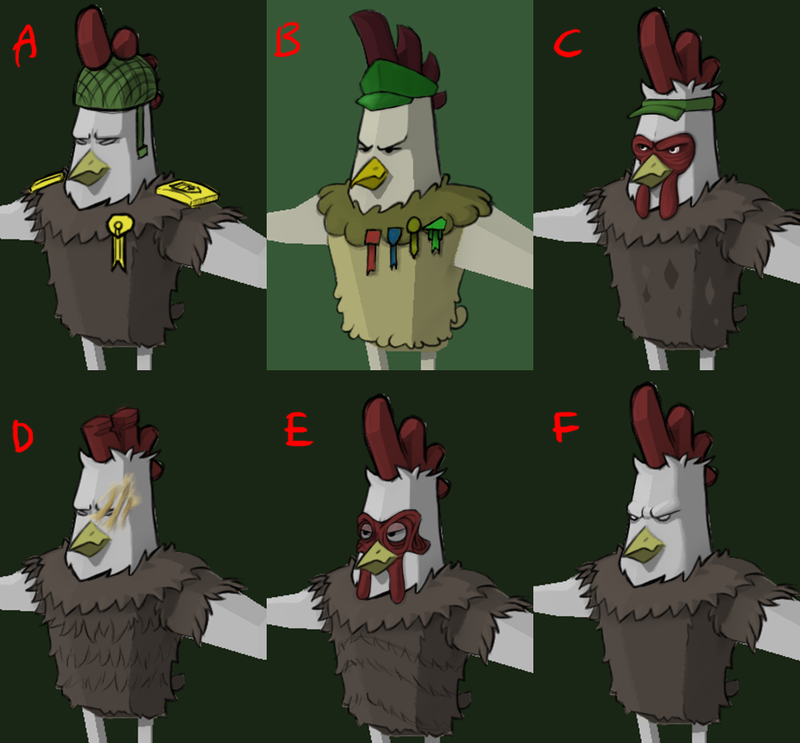 Some tests of what he may be wearing. 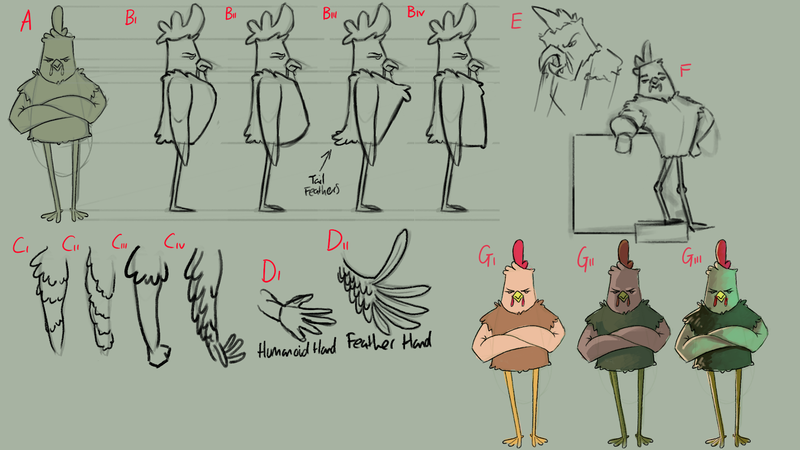 Because chicken legs knees are equivalent to our ankles (in a sense) it is difficult to draw them bent backwards in a manner that looks natural. I may create a box hierarchy in Maya to quickly block out posing and basic lighting information to develop character over the top. 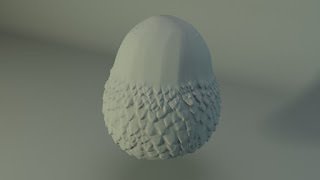 Using the bottom right doodle of what the feathers may look like I took a sphere into ZBrush using various tools, sculpted a poly-painted a feathery design. 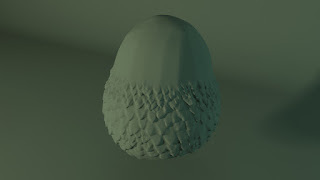 Textures UV's are generated in ZBrush for speed and have some strange artifacts but final character UV's will be clean. 3D View. Topology is a simple ZRemesh in this test. The low topology works well combined with the textures, perhaps even better with either Normal & AO map or Displacement.